I’ve heard it over and over from the fancy life coaches and the self-help gurus, “Show up!” they say. But the words never landed in my brain the way they did when I said those words to myself this morning. You show up for work. You show up for your Doctor’s appointment. You show up at your kid’s sports games. You show up on the phone for your friends. You show up on the computer for your people on social media. 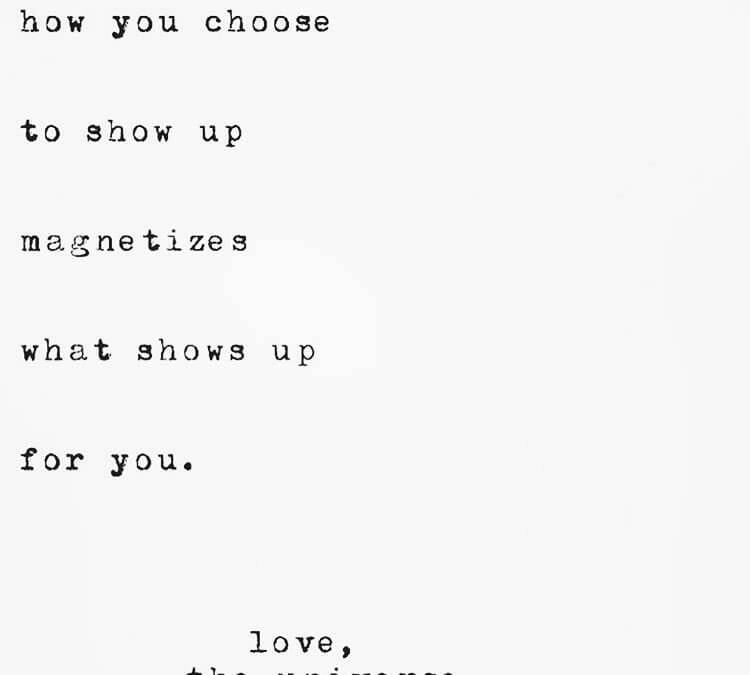 You show up a lot. But how often to you show up for yourself? When you spend your days doing work and tasks for someone else- working a job, taking care of a family- you’re showing up in a big way. Every. Single. Day. But what are you showing up for? Who are you showing up for? If you’ve built a life that constantly revolves around doing things for somebody else – a life where no one ever taught or showed for you what that means to show up for yourself – you’ll want to start exploring how to grow that skill. Because showing up for yourself, every day, is what makes the difference – for your health, for your work and creative practices, for your life (or the life you dream of having). -I fail at showing up for my health. I can’t seem to get myself out the door for my walk, or jog. I tell myself- it’s too cold, it’s too rainy, I can’t take my dog with me (because it’s too cold or too rainy) and it’s more fun to go out with my dog than by myself. Or if my body is especially stiff that day, I may tell myself to skip the walk, stay home, and do lots of yoga instead. But then I stay home and don’t. -I fail to show up for my creative work. I tell myself nobody cares what I have to say. That my words or my art don’t matter. Why would I put all that time in if no one will notice, and my work won’t matter? So, I don’t write, or I don’t paint. -I fail to show up for the life I dream of having. I hide, scrolling mindlessly through Social Media or veg’ing out for hours on Netflix. I eat whatever is easy, instead of planning a meal worthy of my body’s needs. -I catch myself in the talk-me-out-of-living-my-life loop and get back on track. -I get my body outside (cold, rain, whatever) and walk or jog or I bike or I hike. -I sit myself down at the computer and write a simple blog post. And post it. -I prepare meals that make my body sing and shine. Something happens when harness the power of showing up for your health, work, creativity, and your life – your goals become your reality, your work and creative endeavors begin to bloom, and your life moves closer to the one you dream of. Are you showing up for yourself? Where are you failing? Where are you winning? How can you help and support yourself to be there for, yourself? Master the skill of showing up. When you show up for you – you’re loving yourself in a way that will make it easier for you to show up for others and your life will grow bountifully richer and more meaningful.